Activate the bat signal and watch on as a quarter million Mexican free-tail bats emerge from their nestled homes within the Waugh Bridge Bat Colony near Buffalo Bayou Park. 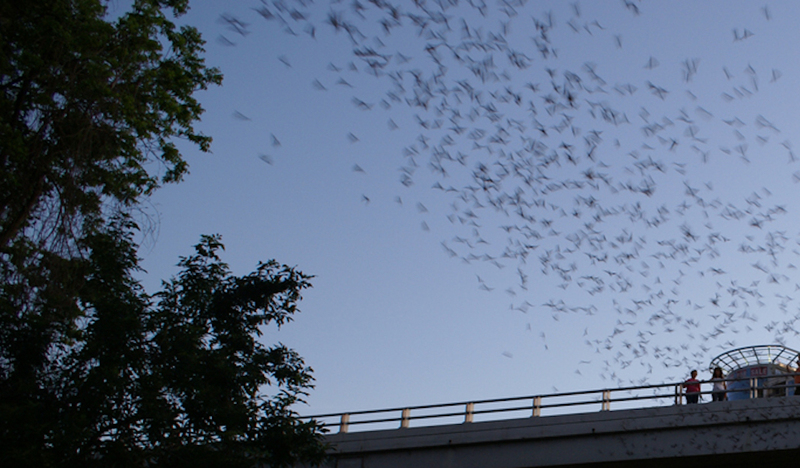 Did you know that nearly every night after dusk, over 250,000 Mexican free-tailed bats spiral out from the crevices of the Waugh Street Bridge at Allen Parkway in Montrose? The second largest urban bat colony in Texas after Austin’s Congress Street Bridge, it’s truly a sight to be seen (and yes, that is what you’ve been smelling if you’ve gone for a walk or jog near the bridge). The bats usually emerge after dusk nightly, but the specific time is not completely predictable. These particular bats are non-migratory, which means they stick around in Houston year-round. It’s thought to be best to arrive about 15 to 30 minutes before the official sunset time as the bats may surprise viewers and emerge before sunset or well after dark. Ample parking is typically available at Spotts Park near Buffalo Bayou Park or within the designated parking areas along Allen Parkway. The best places for viewing include the bridge’s Observation Deck and sidewalk along the Buffalo Bayou Park bank on the corner of Memorial and Waugh and the Memorial Fountain on Allen Parkway. If the temperature is below 50 degrees at sunset on rainy or cold nights the bats might delay their emergence and stay home in the crevices. Guests should also note, the greatest population of bats emerge in August or September, when many freshly minted baby bats (born in May or June) join the fray. Some of the best months to observe are during the summer and fall seasons. 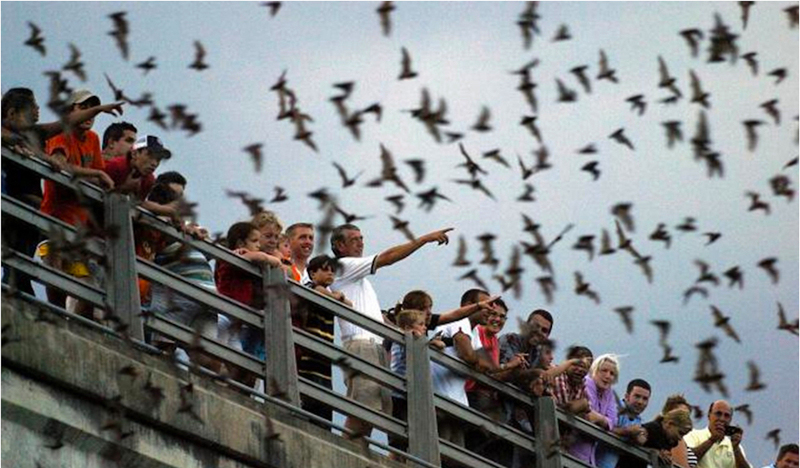 Observing the bats at Waugh Bridge is an incredible experience of nature, but the Houston Parks and Recreation Department asks guests to please respect this natural occurrence with bat-friendly behavior. The HP&RD encourage guests to sit or stand several feet away from the bridge during the emergence to give the bats plenty of room to fly. To best avoid causing harm to the bats or yourself, remember to never stand under the bridge during the emergence. Click here for a complete list of information. 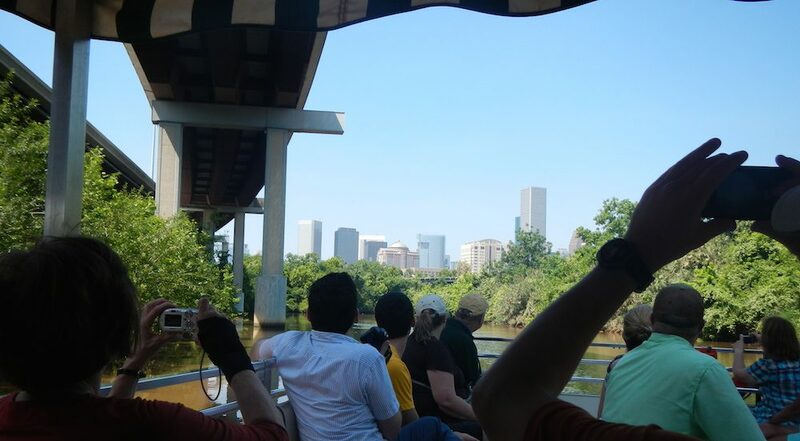 For a unique look at the natural phenomenon, pontoon boat tours presented by Buffalo Bayou Park are also available. Once you take to the water, you’ll experience an amazing and unique view of both Downtown and Waugh Bridge on a tour led by a knowledgeable guide. Guests can learn all about the magnificent flying mammals as you see them from the water. You’ll learn how a bat sleeps, how much a bat can eat in one hour, and how it contributes to the ecosystem. Spaces are limited and boats routinely fill up well in advance of the tour date. Tours may have to be canceled due to inclement weather and children must be at least 4 years old to board the pontoon boat. If you’re looking for an informative evening at the bridge, “swing by” any first or third Friday of the month year-round for a free-to-attend Bat Chat with Houston Area Bat Team volunteers. The team typically meets on the East side of the Waugh Drive bridge along Allen Parkway by the bat viewing platform at 6:30pm to answer questions and assist attendees with viewing. Hours: Daily at sunset; best to arrive 15 to 30 minutes before the official sunset time. Parking: Parking is always available at Spotts Park or within the designated parking areas along Allen Parkway. Admission: Viewings and Bat Chats are free to attend. Click here for a complete list of information. Pontoon Boat Tours are $40 per person. Click here to make your reservation.